Guiding students to VCE success year after year. Cambridge Checkpoints VCE 2019, Victoria's most popular study guides, are updated regularly to incorporate recent official VCE exams and changes to the VCE, providing the most up-to-date exam preparation available. 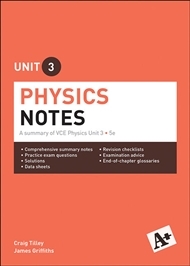 Written for the VCE Physics Unit 3 and Unit 4 Study Design being implemented in 2017, the A+ Physics Exam provides students with school-assessed coursework as well as gradually building their exam skills. Graduated questions are spread throughout the book to help students revise and practise for the end-of-year exam. Copyright © Senior Students Resource Centre (SSRC). All Rights Reserved. All other trademarks and brand names are the property of their respective owners.